If you find you suddenly have some unexpected time off, a last minute holiday can be a great choice for a spontaneous getaway. You can discover new places or visit old favourites and there is no reason why you will not have as good a time as a well planned and researched holiday. Last minute holidays can offer amazingly cheap deals and exceptional value for money and are great for celebrating good news or simply getting away on a whim. So why don’t you head for the sun and leave the UK behind on one of our late deal holidays. 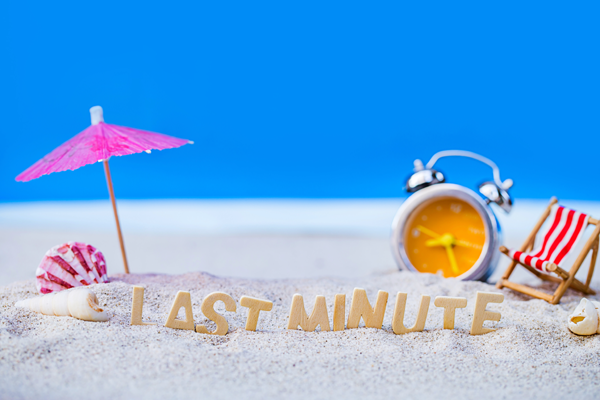 With so many last minute holiday offers available, they are usually the cheapest deals available over the next few weeks from UK airports and all bookable online with JLM Travel or via our UK based call centre. Pick up a bargain last minute deal with huge savings on brochure prices. Fly from local airports and choose the best deal possible. We all lead busy lives and if we are lucky enough to get some holiday from work a last minute deal is a perfect way of seeing new places with a vast amount of routes from low cost carriers, the world is definitely becoming smaller! Last minute holidays can usually conjure up images of the top sunny beach resorts of Europe there is no reason nowadays why last minute holidays shouldn’t venture further afield. Cuba, Mexico, Dominican Republic and the beaches of the Middle East and Far East are so much more accessible with the excellent connections available from regional airports with top airlines such as British Airways, Emirates, Qatar Airlines and Thomas Cook Airlines. Here at JLM Travel we can offer you everything from basic room only accommodation to luxury spa resort hotels. From mainland Spain to the gorgeous beaches of the Caribbean and everywhere in between, we are happy search wherever you fancy! If you would like us to tell you what is available give us a call and we can go through everything that is available. To pick up the best deal you will need to be as flexible as possible in terms of what days you can travel, where you go, what board and where you fly from! You can search for a holiday using the search facility on the top left of this page or give call us today on 0191 391 0160 for the very best offers we have at the time you are looking to go.